Square Own Dungeon Siege IP! Yeah, the hints is all there for around one month, so it’s not that surprising. It’s just that we Dungeon Siege fans just want to at least hope that it will stay as DS. Check out this Gamasutra report about this. I have marked all the bullsheet that I can trace in this reports in bold type. It’s surprisingly a lot of crap in just one short reports. Square Enix surprised fans of Gas Powered Games’ Dungeon Siegeaction-RPGs when it announced it would be publishing the third game in the series, with development handled by Obsidian Entertainment — and Obsidian has now revealed that Square Enix owns the franchise outright, giving the company inroads into the Western RPG market. “Square actually purchased the IP from Gas Powered, and it’s a Square brand now,” Urquhart explained. He said Chris Taylor, Gas Powered founder and original Dungeon Siege designer, reviews every major new build of the game, although Gas Powered is not formally involved in development. Square Enix’s ownership of Dungeon Siege broadens the famously RPG-centric publisher’s reach from Japanese-style RPGs to Western-style RPGs — although Dungeon Siege has always been closer to action-heavy Diablo series than to the narrative-driven Western RPGs like Obsidian’s own upcoming Fallout: New Vegas. That doesn’t mean Obsidian won’t be applying its roleplaying experience to the game, however. While the studio plans to stay firmly with “action RPG” boundaries, Urquhart says the team definitely hopes to beef up the game’s narrative chops, with a rich world, more player quests, and better in-game storytelling. And this is what I called covering up their a**. Like the previous hints from previous BS about DS being made by Obsidian, this is just another one of the whole bunch of crap. London (07 June 2010) – Square Enix Ltd., the publisher of SQUARE ENIX® interactive entertainment products in Europe and other PAL territories, announced today that it is partnering with Obsidian Entertainment® on DUNGEON SIEGE® 3. With input from the original developer, Gas Powered Games®, Obsidian Entertainment will develop the next incarnation of the DUNGEON SIEGE franchise with Square Enix as the game’s publisher. Coming for the first time to high-def home video game consoles, DUNGEON SIEGE 3 will be available for the PlayStation®3 computer entertainment system, the Xbox 360® video game and entertainment system from Microsoft, and Windows PC. Square Enix Ltd., a part of Square Enix Europe business unit, is a London-based wholly-owned subsidiary of Square Enix Holdings Co., Ltd., one of the most influential providers of digital entertainment content in the world. Square Enix Ltd. publishes and distributes entertainment content from the Square Enix Group including Square Enix, Eidos and Taito in Europe and other PAL territories. Square Enix Ltd. also has a global network of leading development studios such as IO Interactive, Crystal Dynamics and Eidos Montréal. The Square Enix Group boasts a valuable portfolio of intellectual property including: FINAL FANTASY®, which has sold over 96 million units worldwide, DRAGON QUEST® which has sold over 53 million units worldwide and TOMB RAIDER® which has sold over 35 million units worldwide, together with other well established products. Obsidian Entertainment is an entertainment software development company passionately dedicated to making high quality role playing games for Windows PC and console systems. Obsidian was founded in 2003 by five game development veterans who’ve produced, programmed, and/or designed award-winning role playing games for a variety of platforms over the last 15 years: Feargus Urquhart, Chris Parker, Darren Monahan, Chris Avellone and Chris Jones. Obsidian Entertainment’s Web site can be found at http://www.obsidian.net. Now currently I’m at level 16. Torchlight is unexpectedly fun! They really have flow of interesting storyline. I still I don’t expect anything from the ending of the story. What could be happen? Anyway, torchlight have some new game mech that turn out to be interesting. One of it is dungeon portal scroll. 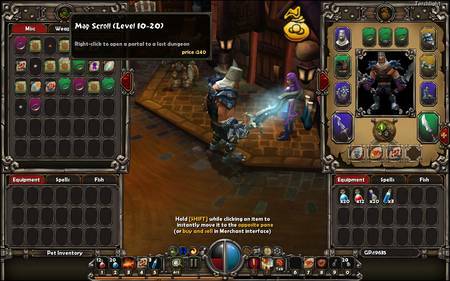 You can buy dungeon portal scroll from merchant at Torchlight town. As you can guess, this scroll open a portal to a dungeon, with different level of monster. Usually ranging from level 1-10, level 10-20, level 15-25 or many other. You can grind for item and experience there. Other thing is, Torchlight is really easy. Not much challenging. Player skill is rather strong compared to monster. Even the boss monster. This make fighting boss monsters rather unsignificant. I don’t even remember any boss name, not even the strongest (and i don’t recall any strong boss). Playing this could be very much of smooth sailing. Stay tuned! Torchlight have came out just several hours before. Runic also decided to release their game demo for prospect to try out their new arpg. So, I download the demo and go out for a play test. Well, just as I suspected. Torchlight is just to similar to FATE. Look in the shot. The same fishing in the FATE. There are some more similarity to FATE. One central town where player take quest. Pet system is exactly the same. Their world sytem. You go outside the town into dungeon and proceed downward into levels of dungeon. Same like Diablo 1. I would say, this is just too weak of ARPG. Same for FATE. I never like FATE. New thing that I don’t like here is the way the camera move when opening a window or talking to NPC. I felt kind of dizzy to that. I hope there will be patch for it. Other thing, the new game engine is smooth and pretty. Inventory system is quite good. All item have same size, no need to play tetris arranging item in inventory. Skill system looks good too, but I still haven’t explore much of it. Only level 2 by now.